JAGNA – The Honorable Mayor Fortunato R. Abrenilla signed on January 25, 2016 Executive Order No. 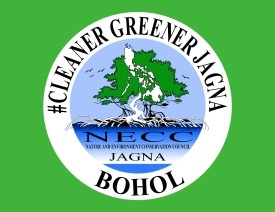 004-2016 “AN ORDER RECONSTITUTING THE NATURE AND ENVIRONMENT CONSERVATION COUNCIL (NECC) IN THE MUNICIPALITY OF JAGNA, BOHOL TO ACT AS GUARDIANS OF THE ENVIRONMENT/MOTHER NATURE AND DEFINING THEIR FUNCTIONS THEREOF”. The Executive Order is anchored on Section 16, Article II of the 1987 Constitution which provides that the State shall “protect and advance the right of the Filipino people to a balanced and healthful ecology in accord with the rhythm and harmony of nature”; Local Government Code provision stating that it is the duty of the LGU to protect and co-manage the environment and enhance the right of the people to a balanced ecology; RA 3571 which prohibits the cutting, destroying or injuring of planted or growing trees, flowering plants and shrubs or plants of scenic value along public roads, in plazas, parks, school premises or in any other public ground. In order to promote and conserve the beauty of objects of scenic and ornamental value along public places and help preserve cool, fresh and healthful climate necessitates the creation of a council that will carry out effectively such role and responsibility. The composition of the council includes LGU officials and employees and environment advocates that have understood their functions as officers and members. The NECC has conducted mangrove planting in Can-upao and Banyan Tree planting in Tubod Monte Integrated School as part of its initial projects. Launching will be held in Can-upao on March 4, 2016 in the morning.